Your very own Doodle Draw lets your kids to paint their imaginations without any flaw. The creative app from Finoit Technologies offers easy-to-use and interactive features, fair enough to motivate your young ones to twist their creative bones and create some real masterpieces. - 8 super cool brushes. 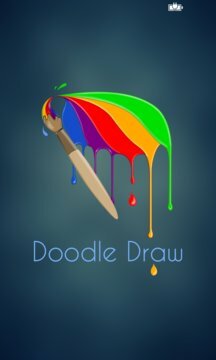 - Create doodles on black or white canvas. - Doodle on the images from phone gallery. - Undo, redo and clear the creations. - Tweet, share or mail the drawings to family and friends. - A spate of paint brush shades including solid color, spray, ribbon, watercolor, fluorescent, filled polyline, line brush and ellipse brush. - Extensive color palette with an exclusive range of color themes to choose from, such as firenze, neutral blue, cherry cheesecake, watermelon and many more. 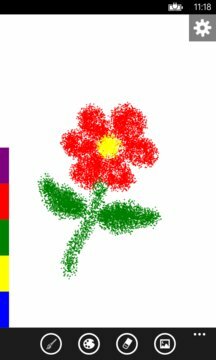 - Ease to choose brush size within the range of 7 to 40 pixels. - Eraser to clear the canvas. - Option to share the drawing via mail, social media such as Facebook, Twitter, instant messengers, etc. - Facility to pick images from your smartphone’s gallery and modify them with all the available fascinating drawing & painting options. - Setting panel to change canvas color, undo, redo and clear the operations, save the drawing and share the same online with the loved ones. - Offline app that is available for install on Windows Phone absolutely free. With Doodle Draw, the magic comes to life right through your kids’ tender fingers. It’s not just an app but a tool to brush up the minds of today’s young guns. Don’t forget to rate Doodle Draw if you and your kids really enjoyed it to the core. Your suggestions matter a lot in the wake of its future improvements.